The Leap Motion controller may still be a few months away from its commercial release, but already third-party devs are showing us what this nifty tool is capable of. A video has popped up on YouTube showing one crafty coder transforming the Leap Motion into his own personal drum machine. 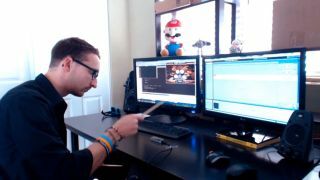 By swinging sticks over the active area, he is capable of producing a number of different drum sounds within a range of different volumes. Though, apparently playing the drums in a musical way is quite difficult. "It wasn't easy to play drums with it. I used the velocities and the position of the pointables on the X axis. Basically I play a note when I reach the right velocity (down motion) then to avoid the note to be played many times I wait for the velocity to be crossed the other way (up motion)." said the video's creator, who goes by the handle Gratoo. Not content with his percussive feat, the same dev has also created a pitch-bending tool for his guitar and a way of controlling the EQ of an electronic keyboard all with the Leap Motion. The guitar sounds are especially good, and look like a lot of fun to make. Of course, the Leap Motion will likely find far less melodic uses when it is shipped in the next few months. Primarily it is designed to created a touchscreen-like input for computers that don't have touch screens built-in. The LeapMotion unit sits into of any monitor and creates a 3D interaction space that can detect input from hands or other objects and is smart enough to differentiate between ten different fingers. Leap is taking pre-orders for the controller now and is promising delivery in "early 2013".